| Why Buy from The Large Art Company? from The Large Art Company? If you’re not asking that question you should be because the purchase of a bronze sculpture can be a significant investment. It is also a timeless and nearly indestructible piece of art that should be around for many generations to come. We have seen all kinds of junk on the internet being passed off as bronze sculpture Some have even claimed to make things for us. Anyone can get a hold of pictures and throw up a web site and make outrageous claims of quality and experience, but do you really know who these people are or what you are getting? I can't tell you what you should do, but I can tell you what sets us apart and why you can feel confident buying from us. Unlike most online bronze dealers, we are real people who are experts in bronze sculpture because that's all we do. 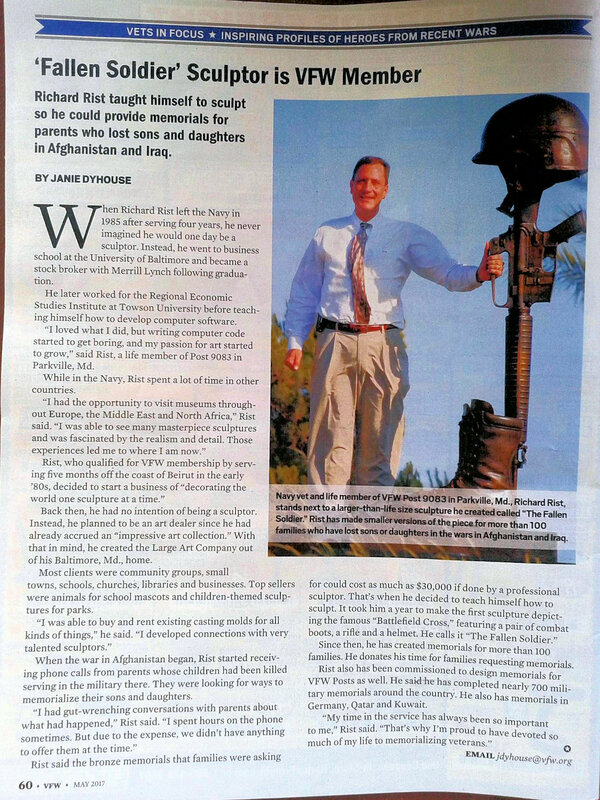 We have a real office and studio in Baltimore, Maryland that you can visit should you choose to do so. We have a national reputation for our work and sell some of the finest sculpture made today, so protecting our reputation is important to us. Our work can be seen in museums, public art displays, as well as monuments and memorials around the country. 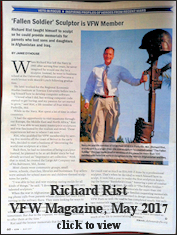 In May 2017, Richard Rist, the owner of the company, was featured in VFW Magazine for his work making over 500 sculptures for military and veterans monuments and memorials around the United States. He is also a veteran himself. So a piece of art from us actually means something and contributes to its lasting value. And probably most important to you is that we give the type of personal customer service that you would expect when making a purchase of this nature. We don't have vast cubicles of customer service representatives who have no idea what they are selling. When you call here you will most likely reach the owner of the company or his assistant, and we can guide you through every step of your purchase and installation. We stand behind everything we sell and if you do have a problem, you will deal with the very same person that took your order. This level of service is rare when shopping on the Internet. Our expertise in the bronze sculpture industry is not just puffery. The owner, Richard Rist, is an artist and a sculpture dealer and collector for over 25 years. In addition to our in-house studio, we work with a network of independent artists around the United States. We’re not a big business, but this is our profession. Small, but mighty we like to say. The Large Art Company is one of the most respected art dealers in the country. Artists and foundries are eager to work with us, so if you are looking for something and don’t see it on our web site you should call or drop us an email. There is a good chance we can get it and if not we can make it. Our prices are always fair and we stand behind every sale we make. About our competitors, let me just say this; anyone can get a hold of a catalog and put up a web site. We see them come and go every day. One company boasted about their quality while importing cheap bronze from Thailand and sporting an "F" rating from the Better Business Bureau (BBB). Many of them have never even seen the sculptures they sell and routinely engage in false and misleading advertising. Most of them remain anonymous, provide no physical location and are only reachable by a PO Box. Would you really want to purchase a piece of art from a company like that? Once you purchase a bronze sculpture, one of the most common questions you will get is, “where did you get that?” Well, we want you to be proud to answer, "a bronze company in Baltimore called The Large Art Company." So, if quality and fair prices are important to you, you should buy from us. If one-on-one customer service from knowledgeable, experienced professionals is important to you, you should buy from us. If the reputation of the source of your sculpture is important to you, you should buy from us. And if you like to work with veteran owned businesses you should buy from us. Obviously we want your business and it is important to us. But we don’t just want your business now. We want your business in the future and all your family, friends and associates. If there is one thing I know about my customers it is that they rarely own just one piece of bronze art. 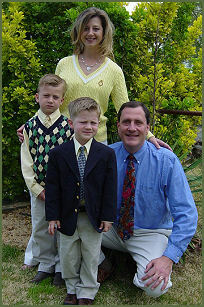 Every day we get calls from previous customers to order again or referrals from family and friends. That speaks for itself. But our relationship does not end with a purchase. We will be here after the sale as well, to answer any question you might have about care and cleaning, installation, advice about sculptures from others, or whatever. We will never treat you like it is an imposition. We have actually held a conference call on our day off to advise a community group on sculpture installation, at no cost whatsoever. Moreover, if, God forbid, you should ever have a theft or fire, we are happy to provide you with duplicate receipts, certificates of authenticity or whatever you need to make a claim with your insurance company and get full value for your loss. I realize this sounds like a sales pitch because, well, maybe it is. But it is also true. Bronze sculpture is an investment in a timeless and nearly indestructible piece of art that will be in your family for many generations to come. Unless you are very young, I'm sure you have learned that the cheapest is rarely the best deal.